If you want to sell items online, then you need to make sure that you deliver the very best product images for each one of your listings. High-quality images allow your potential customers to see the product from up-close before they initiate a purchase. There is a huge amount of information and detail that you need to pack into your photography. A visitor to your website does not have the luxury of picking up the product and looking at it from all angles. Online buyers most of the time have unrealistic expectations, and these are mostly caused by a bad description and sub-par product photography. If you want to generate more sales online, then you should consider using the following tips on this page. They will help you create outstanding pictures for your online shop and increase the most vital aspect of your business – conversions. Your product photography has to bring a unique story. Each one of the frames needs to communicate something to the audience, and this will bring with it a specific emotion. Use that to your advantage, and communicate the right ideas and emotions. The results can be dramatic because of it. A good idea here would be to use the colour theory to your gain. The idea here is that you need that to create a sense of luxury, impulse, harmony or whatever mood you require. Depending on the colours you use, you can have a specific impact on the potential customer. The influence of colour can not be underestimated. You have to identify what each colour does, and you have to use it to your own advantage. Take a look at the colour emotion guide below, it will give you a clearer view on how colour is used to a brands advantage. What you need to keep in mind is that light sources can deliver different features based on where they are located. Natural light will always be better for product photography. But the reality is that most product photos won’t get the ultimate results unless you start adding your own artificial lighting system. Don’t overdo it at first. Start with a single light and see if you can get the results you want. Increase the amount of lights to get the results you want. Remember that adding in a single light will bring shadows and reflections to the shot. Multiple light sources may be able to help you in this regard. Also, when you choose the lighting systems you want to use, you have to consider a few things. Will the light accentuate the material and shapes of the product, or will it have a negative effect. You also have to think about setting the right mood. Visitors will associate your product in a specific way if you set the right mood and consistently repeat the same mood in all your shots. This intern will create a ‘feel’ for your overall brand. And yes, all this can be created with some decent lighting. Should you use natural light? Natural light offers a great way for you to showcase your products, but it works only if you want an organic, natural look. There are downsides, such as a higher ISO setting, long exposure times, problems with the unwanted ambient lighting and so on. More importantly you lack the control you would want for product shots. If you want to shoot multiple product images, you will not be able to get the consistency that you may need. You want to be consistent with the image tones and colours, and that’s almost impossible if you use only natural light. Can artificial light be the answer? The primary advantage that comes from using artificial light is that you get a very consistent output. All images will have the same tone, colour palette, saturation and features. They won’t require any camera changes either, so they can also be shot very fast. This is especially helpful in a conceptual or styled setting. It works to your advantage, and it can pay off extremely well in the end. A big plus is that you have the right control over your product photography. You have multiple techniques you can use to shape the light as you see fit. There are some downsides to artificial lighting. The overall costs can be very high especially if you go for the high-end gear. You also need to have quite a lot of space, and that’s true specifically if you have a complex lighting setup. Of course, you won’t be able to create perfect shots right from the start. It will take a lot of time and effort to test out all functions and give them a try. It will certainly be worth it in the long run. You should always make sure that your product photography isn’t stale. It has to tell a story; you need to create multiple pictures that connect with one another and showcase specific ideas that your customers will connect with. Every texture and feature will showcase something and you need to take all of that into consideration. The idea is to convey the smell, feel and sound of that product via images. It’s not going to be easy, but with the right reflections and focus on textures and colours you will be able to do it. If you want to start with a distinct approach, you should focus on the brand first and lastly the message. It’s important to showcase the details of each product and connect each picture with one another so you can get the best possible outcome in terms of brand and site identity. The image on the left is an example of splash being used to speak to the cleansing nature of the product. The image on the right is an example of someone using splash techniques just because they can. Should you use Filter Effects? Using filter effects for product photography is an option. There are a number of options that can bring in create some nice visuals. But the problem is that they may not be suitable for your own brand identity. So, you need to be very careful how you incorporate them, if at all. Brand consistency and colour balance need to be taken into account before you start messing with effects. Sometimes these work, other times they won’t. Are the brand logos and labels legible? You may want to showcase your brand, if so you need to make these standout. Use the right surface. Sometimes a plain surface can do wonders for your product. You can also opt for a more complex surface if you believe that the product can stand out this way. Make sure that your props make your product stand out. It shouldn’t be the other way around. In most cases, less is more. Don’t include dozens of props just for the sake of using them. You will be able to achieve great results with some nice props. But you should never add them to the detriment of the main focus – your products. A starting point is to shoot your pictures, edit and then print them out to see the output. This may seem a bit excessive, but it is a great way of making sure that everything works correctly and the results will be a lot more effective in the long run. IT’s great to see all of your previous projects up on a wall. You will be able to see your brands uniformity, and quickly detect when something is different. You should try to minimize the amount of editing that is required on you product shots. Editing using software can be very time consuming. It can cause bottlenecks in the process of getting your products onto your website. Editing skills improve with experience. Together with efficiency and speed. It can take a little while to identify the right product photography tricks that work for your products. The tips listed above should help you get started on your quest to get great looking product images on your site. It can take a lot of time and effort, numerous tests and plenty of mistakes to find the right workflow for you. Make sure that you always learn new tips and ideas about product photography, because the more you learn, the better you get. Practice as much as you can. 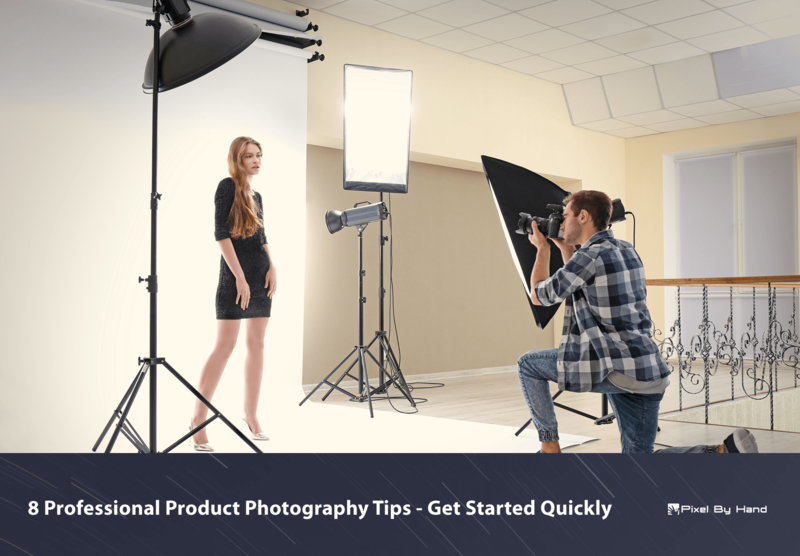 The more you practice, the easier it will be for you to become an expert in product photography! Check out our blog for more detailed articles on the aspects discussed here.